Shut off water supply valves, then drain the lines by turning faucet on. Use an Allen wrench to loosen the set screw holding the handle in place and remove handle. Loosen and remove the adjusting ring by using the special wrench provided in the repair kit. To remove cap, use pliers and turn counter-clockwise. Protect cap finish with cloth. Remove cam assembly by pulling up on ball shaft. You may need to use pliers. Removing seats and springs is best done by inserting a pencil or sharp tool into the seat assembly and gently lifting it out. Check and clean inlet ports before replacing seats and springs. To replace “O” rings on body, use a sharp tool to pry away from body. Roll new correct size “O” ring into place. When reassembling, be sure to align slot in ball with pin in body and key on cam with slot in body. Hand-tighten the cap, then screw adjusting ring into place with special wrench and replace handle. Turn on water and check for leaks. If necessary, further tighten the adjusting ring. Pry off decorative cover and remove screw cap. Pull retainer clip from its slot. Using pliers, lift cartridge out of body. 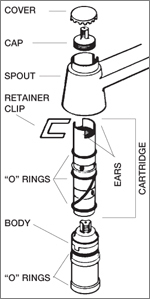 Note position of cartridge ears so that when replacing, they are in identical position. Remove “O” rings by prying away from body and rolling new ones into place, or replace entire cartridge. Shut off water supply valves, and drain the lines by turning faucet on. Lift handle up as far as possible and loosen set screw. Lift handle off and unscrew cap. Loosen screws holding ceramic disc cartridge in body and lift cartridge out. 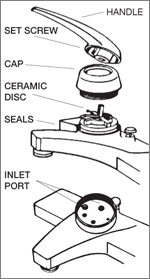 On underside of cartridge are the set of seals that should be replaced. Check and clean inlet ports. Reassemble by reversing the above procedure, being sure cartridge holes align with inlet ports. Shut off water supply valves, then drain the lines by turning both faucet handles on. Pry off decorative cap on handle and remove the screw holding the handle. Gently pry off handle with a screwdriver or use a faucet handle puller. Use pliers or wrench to remove stem locknut/bonnet. Depending on style of faucet, either unscrew stem or lift up to remove stem cartridge from faucet body. To replace stem washer, remove brass screw (Fig. 3) and replace washer. 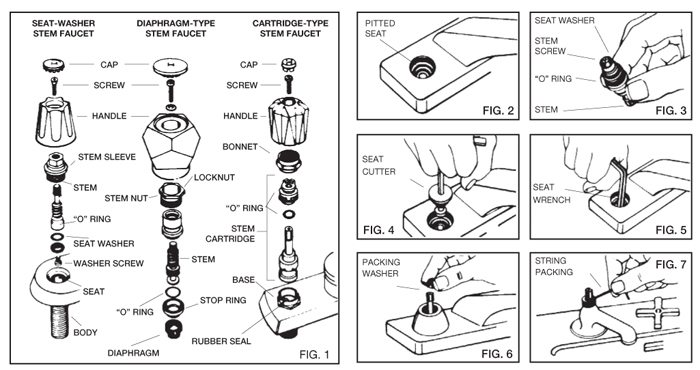 To resurface a worn or pitted faucet seat, insert faucet reseating tool as shown in (Fig.4). Press lightly and turn handle clockwise several times. Check for smoothness and be sure to remove filings with damp cloth. To remove an old seat, use faucet wrench (Fig. 5) and turn counter-clockwise, then lift it out. When installing a new seat, use pipe joint compound on outside threads of the seat to ensure a good seal. Leaks at the faucet handle can usually be stopped by replacing the packing washer (Fig. 6). If you do not have or cannot get the correct washer, string packing (Fig. 7) can be wound clockwise around the stem using 1-1/2 times as much thickness as would be required to fill the packing nut. When the nut is tightened, the packing compresses into solid form and acts as a seal. Newer cartridge stems simply require the replacement of “O” rings to eliminate leaks.